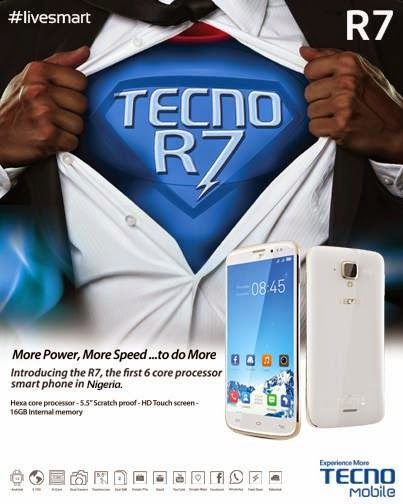 The Tecno R7 smartphone is an awesome android device with much outstanding features. Lately, I made a brief review about the tecno r7 smartphone, today, I would highlight three things that you don't know about the tecno r7. The tecno R7 smartphone is a well integrated device with high sensitivity, am quite sure that you won't be aware that the tecno r7 smartphone can answer call by just wavings hands over the screen of the device, that is quite a high-tech and it's proved the tecno device of high sensitivity. Though this feature is common to few other android smartphone, but most of you aren't aware that the tecno R7 smartphone can also be locked through just a voice command. Isn't that great? It's quite common for every other android smartphone to run a multi-task feature, but that of the tecno R7 is of more stand due to, it have the ability to watch videos while performing other activities like texting, pinging, etc. simultaneously. Tecno R7 smartphone is a very portable device that comes in form of a phablet with a display size of 5.5 inches. This smartphone operates on an Android 4.2.2 Jelly Bean, and it uses the OTA (over the air) update, which enables the device operating system be easily upgraded whenever there is an avaliable update. This smartdevice also has a storage ROM of 16GB with 2GB of RAM and it's powered by 1.5GHz hexa-core CPU and it's microSD card space accepts card of upto 32GB. It also uses a dual sim slot, achieves network speed of about 3.75G and it's also wlan enabled with Wi-Fi hotspot and Wi-Fi direct with dual-band. It has a long lasting battery and it's battery type is 2430mAh Li-on. I'd recommend every tecno r7 user to go with the MTN-Mid Night Plan which offers 3GB of data plan that is strictly for night usage and also gives a 1.5GB bonus plan that can be consumed anytime durning the day, that is, the plan offers a total data of 4.5GB in exchange of #2,500. I hope with this brief facts have highlighted above about the tecno r7 smartphone, have been able to convience you that the smartphone is really a great smartphone with outstanding features. I'd recommended anyone that wishes to buy an affordable smartphone should go for the tecno R7.